Whether the problem is an engine turning over without starting, a rough idle, problems with acceleration, or anything similar, a fuel pressure test diagnoses or eliminates one of the key suspects as the cause. A proper fuel pressure system test will determine how much pressure you’re getting into each cylinder, in the fuel system overall, and whether your fuel pump(s) are defective. While most often recommended as a test to check fuel injected engines, which we’ll focus on here, a fuel pressure test can also be done on carbureted engines to check fuel pump viability. While some mechanics will jump right into plugging a fuel pressure gauge onto the rail, it’s actually easier to check the fuel pump itself, as it is the most likely culprit if your fuel pressure is low or intermittent. Especially in a no-start scenario. Checking the fuel pump is as simple as listening for it activating when you turn on the ignition key. Locate the fuel tank – it is usually mid-mounted on the car, between the frame rails, often underneath the rear seat or forward portion of the trunk. With the key off, position yourself or someone as close to the top of the tank as possible (under the car, if properly lifted and secured, or with an ear down on the back seat, for example). Turn the keyswitch to the “on” position without cranking the engine (all the way forward). There should be a clicking or whining/hissing sound near the fuel tank. This is the fuel pump activating. If you do not hear that sound, do a fuel pump relay bypass to check again. Locate the fuel pump relay on your engine’s circuit diagram. It is usually in the engine compartment’s fuse box. Remove the relay and either replace with a new one (if available) or use the diagram and your manual’s instructions to create wire “jumps” to bypass the relay and activate the pump. If the pump activates, you likely have a bad relay. If all of that fails to find a problem, check fuel pressure. Sometimes, pumps work fine or intermittently and the problem may be a blockage or other issue in the fuel system. Fuel pressure testing is done four different ways. Most commonly, mechanics will do a Static Fuel Pressure Test followed by a Residual Fuel Pressure Test. These can be done so long as the fuel pump is activating (turning on) and can be done from the fuel rail or at the fuel filter without requiring removal of the fuel tank to access the pump directly. To do these tests, you’ll need a fuel pressure gauge and the ability to hook it to your fuel system. You will also need to know how to depressurize your fuel system safely so that you can attach the gauge safely (see your shop manual for details). 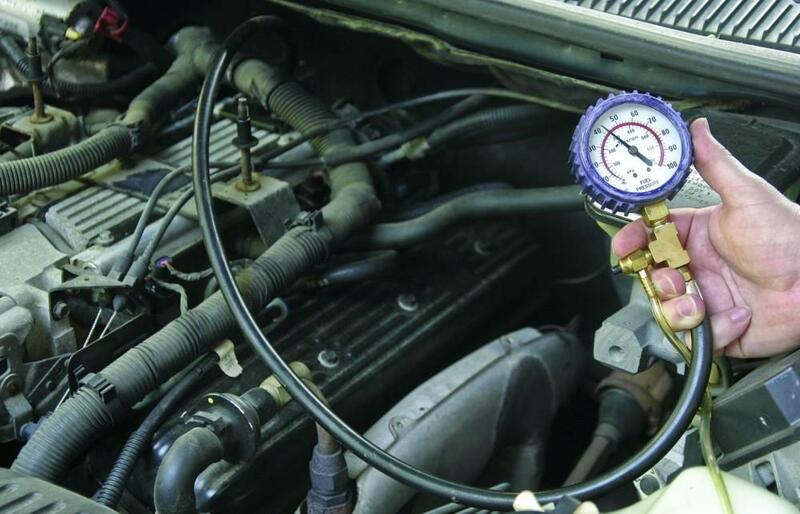 Most vehicles in North America have a test fitting on the fuel rail specifically for attaching a pressure gauge. European cars are often an exception, so the gauge will have to be fit at the fuel inlet to the fuel rail instead. To perform a Static Fuel Pressure Test, simply activate the pump via the relay or keyswitch (do not start the engine) and watch how high the pressure on the gauge is reading. It should quickly ramp up to specification (within a second or so). For most vehicles, this is somewhere in the 30-80 psi range, depending on application. It should hold steady once up to spec. Next, perform a Residual Fuel Pressure Test by turning off the key or removing the relay jumpers and watch the gauge again. The system should hold its specified pressure for several minutes. If it doesn’t, you have a leak. Common culprits are the fuel pump check valve, fuel pressure regulator, or faulty injectors. If the engine will start, you can perform a Running Fuel Pressure Test as well. Start the engine and let it idle. Your shop manual for the vehicle should specify acceptable fuel pressure ranges while running, both at warm-up and warm idle. Low pressure indicates a problem with power to the pump or the pump itself. Clogged fuel filters can also be a problem, as can fuel delivery issues such as a clogged inlet sock. Finally, if you wish to test the fuel pump directly, do a Dead Head Pressure Test. This checks the outlet pressure of the pump at maximum output. This test is best performed at the pump itself or on the fuel line before the fuel filter. With the gauge attached, simply pinch or block the return fuel line so no fuel can return to the pump/tank. This will result in the fuel pump running at “dead head” (highest rate) as the system assumes that no fuel return means a high rate of consumption. For most pumps, this will mean operating at about double their normal operating pressure. Check your vehicle’s specifications to be sure. Once the fuel pump’s operation has been ruled out as the problem, you can move on to other things such as injector and regulator testing, fuel volume tests, and more. We’ll leave those for a future article.